1. not exorbitant or extravagent by city standards, however in a rural setting (like upstate new york) it is in fact, quite fancy. 2. a wonderful blog dedicated to art, design and other things that are indeed upstate fancy. If you know me at all you know I am not a fan of warm weather. Give me a pair of jeans, a hoodie and a high of 65 I would be set for life. I do however love the changing of the seasons, spring included. That time of year when the colors come back into the world. Perch! design also seems to have a strong attachment to spring as well with their beautiful glazes they use on all their pieces. 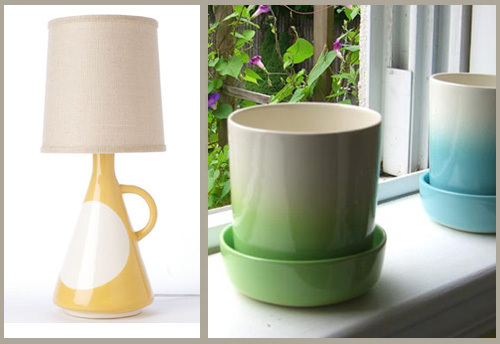 My two favorites are of course the Frida desk lamp and these mini fade pots. How cute would these be lining your windowsill or sitting on the back deck? Now if only I could buy a green thumb to go with them! No Responses to "COME ON SPRING with perch! design"